Grilled Chicken Satay with Warm Peanut Sauce, easy summer recipe. Cut chicken breast into long strips, 3 or 4 from each breast. Thread the meat the long way onto the skewers, (sort of pleating it). Mix the rest of the ingredients in a small bowl. Place chicken skewers into a baking dish and pour marinade over. Allow to marinade for 20 - 40 minutes. When ready, remove from marinade and grill over direct heat for 8 - 10 minutes. Can also be done under the broiler (grill) for same amount of time. Or, you could skip the skewers and stir-fry them in 1 tbs olive oil and 1 tsp sesame oil. 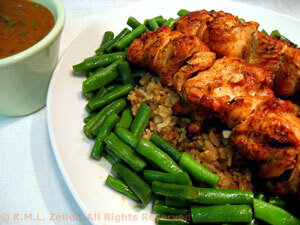 Shown served on a bed of Brown Rice with Crisp Green Beans.